SKU: PD-MIDGSERP. Categories: Pendants, Mythical Creatures. 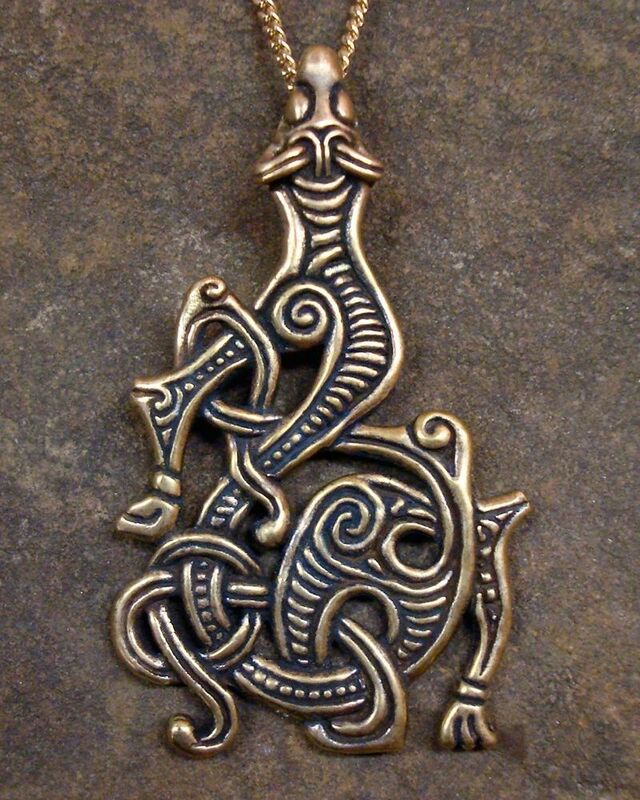 Strike fear into the hearts of your enemies (or frenemies) with our Midgard Serpent Pendant! Available in bronze and sterling silver, this pendant is 2 ½” tall by 1 ½” wide (62 x 33 mm) and it comes with an 18″ gold or silver-tone steel chain. In Norse mythology, Jörmungandr was the second child of the god Loki and the giantess Angrboða. He took the form of a mighty sea monster. Displeased with the union between Loki and Angrboða, Odin threw Jörmungandr into the ocean. There he grew until he was so large he was able to encircle the earth and came to be known as the Midgard Serpent. It is prophesied that at the end of the world, known as Ragnarök, Jörmungandr will battle Odin’s son, Thor. It is said that though Thor will be able to defeat the serpant, he will succumb to Jörmungandr’s poisonous bite and will only be able to take nine steps before collapsing. After this, people will flee their homes, the sun will become black while the earth sinks into the sea, the stars will vanish, steam will rise, and flames will touch the heavens.